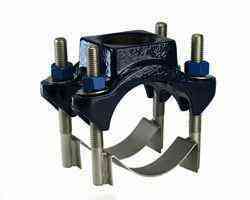 Service Saddles provide a quick, dependable means of tapping pipe for branch connections, 1/2" through 2-1/2". Use of economical JCM Service Saddles eliminates problems common to direct taps, such as leaking threads or split pipe, and the saddle reinforces the critical connection. High pressure performance is assured by the broad, pressure activated gasket. Permanently set in a retaining cavity, the contoured gasket produces a positive initial seal which improves with an increase in line pressure. The 406 saddles, with their wide bodies, and large sealed outlet areas, provide an excellent means of repairing holes, pin holes, and leaking. 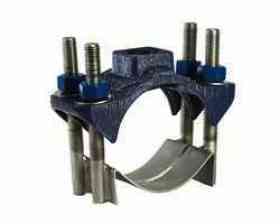 The saddles are exceptional for making 3/4" and 1" direct taps. (ASTM D 2240) (Shore D) ?? *(1,000 g load/1,000 cycles) ?? Chemical and Durability Properties ?? ?? for hydrocarbon service other than intermittent contact or splash zones. Humidity Resistance (ASTM D-2247) No blistering or loss of gloss after 1,000 hours. * Data obtained using 13 mil coatings ?? ** Data obtained using 20 mil natural coatings. Addition of pigments may cause varying results. Service Saddles for pipe sizes 2" through 12" shall have a wrap around design, with a ductile iron body, and will be fusion plastic coated. The coating thickness shall be a minimum of 12 mils with a dielectric strength of over 12,000 volts. The gasket shall be a broad pressure activated design, molded from virgin rubber, and will be bonded into a cavity in the saddle body, which provides internal, as well as external, gasket retention. The straps, bolts, nuts and washers shall be 18-8 stainless steel with all welds passivated for resistance to corrosion. The combined strap width shall be 3-1/4" to provide a wide stance on the pipe. Service saddles for pipe sizes 14" through 24" shall have two (2) 2-3/4" wide stainless steel straps. Service saddles shall be 406 or an equally approved model. Model 406 - Bands, Bolts, Nuts and Washers are 18-8 Type 304 Stainless Steel. Gasket: Compounded for use with water, salt solutions, mild acids, bases. Finish: Models 406 - Fusion Plastic Coating: fusion bonded, high density blue plastic coating, 12 mils minimum thickness with a dielectric strength of over 12,000 volts. The 406 utilize the heavy duty double strap saddle body with two wide stainless steel straps. The extra wide straps provide a broad supportive stance on the pipe. The model 406 is fusion coated with a heavy resilient plastic coating. Coated Saddles are constructed with ductile iron with a high density fusion plastic coating and have 18-8 Type 304 Stainless Steel straps, nuts and washers for high corrosion resistance. These saddles meet or exceed AWWA C-800 standards for service line fittings. BODY CASTING: Wrap around design of Ductile Iron, ASTM A-536. Body has a gasket cavity, which provides internal as well as external gasket retention. GASKET: Molded virgin rubber with a pressure activated hydro mechanical design. Gasket is bonded into a cavity for internal and external retention. Gasket suitable for water, salt solutions, mild acids, bases, and sewage. STRAPS: Stainless steel, 18-8 Type 304, the straps are equal to or greater than the internal diameter of the gasket to provide for proper pipe support and gasket loading. Strap is 14 gauge stainless steel. Straps are passivated for corrosion resistance. BOLTS, NUTS WASHERS: Stainless steel, 18-8 Type 304, passivated for corrosion resistance. Coated with antiseize compound to reduce friction and galling. COATING: Casting is coated with fusion bonded high density blue plastic, 12 mils minimum thickness, with a dielectric strength of over 12,000 volts. Water absorption less than .20% (less than nylon), which prevents undercutting and blistering. Tighten nut(s) to following torque values presented in more detail in the PDF below.